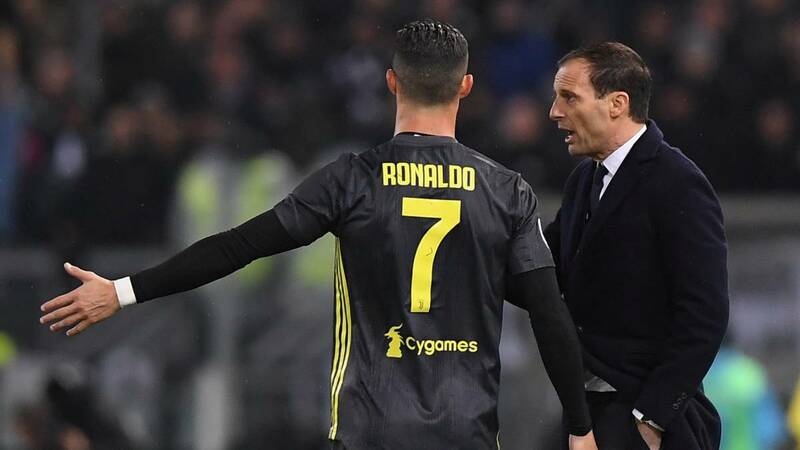 Home Soccer Allegri and the current intensity of Cristiano: "Madrid took a vacation a year ago ..."
Allegri and the current intensity of Cristiano: "Madrid took a vacation a year ago ..."
"Here Cristiano started from the beginning of the campaign, he has more intensity with respect to Madrid," said the Juventus coach. Massimiliano Allegri, Juventus coach, defined on Tuesday as "crazy" to ensure that the Turin team, rival of Atletico Madrid in the round of 16, is "favorite" for the final triumph in the Champions League. "El Madrid match is a football match and nobody can say that Juventus is the super favorite and the number one team in the Champions League, it's crazy, "assured Allegri during the press conference prior to the quarterfinals of the Italy Cup against Atalanta. "The Champions League is our goal, just like the Serie A (Italian First Division), the Italian Cup or the Italian Super Cup", continued the Juventus coach, whose team leads the league competition with eleven points advantage over Napoli, second. Allegri also considered that the "bianconero" box, which will be measured against Atlético Madrid on February 20 in the tropolitano and on March 12 in Turin, he will need to be "good and lucky" to advance in the Champions League. The Juventus will visit Atalanta on Wednesday, in a match in which Allegri will not be able to count on Leonardo Bonucci, Andrea Barzagli and the Colombian Juan Guillermo Cuadrado, all of low for injury. You will be available to the Uruguayan Martin Cáceres, incorporated in this market session from Lazio after the departure of the Moroccan Medhi Benatia al Al Duhail Sports Club catarí. In his appearance in press conference, Allegri also considered that the Portuguese Cristiano Ronaldo is playing this year with more intensity with respect to what happened last year in the last season of Portuguese at Real Madrid. "At the level of athletic data, Cristiano is doing an optimal season. It has more intensity with respect to Madrid. In Madrid a year ago they took a 'vacation' time, here started from the beginning of the campaign ", said Allegri. In this season, Cristiano participated in all the matches of Juventus, except the Champions League against Young Boys, in which he was suspended. Only was a substitute twice, against Atalanta in the league and against Bologna in Cup, while he was substituted in a single occasion after leaving the starting line, ten minutes after the end of the visit to the Fiorentina The Portuguese scored 15 goals in Serie A and one in the Champions League.